Mix 1/2 cup sugar and cornstarch in a medium saucepan; stir in blueberries and water; heat to boiling, stirring constantly; boil and stir for 1 minute. Pour into greased 1 1/2- quart casserole dish. Mix 1/3 cup sugar and flour; cut in butter with knife or fork. Sprinkle over blueberry mixture. Bake for about 15 minutes until golden brown. 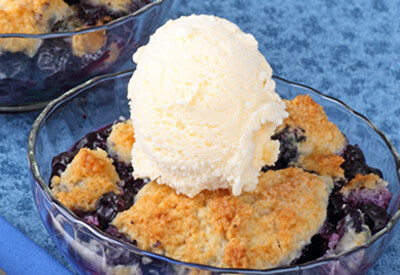 Serve warm topped with ice cream or frozen yogurt.